Sep - 28 | By: Martin Jones | one comment. (Students call (503) 667-8848 for discount code). 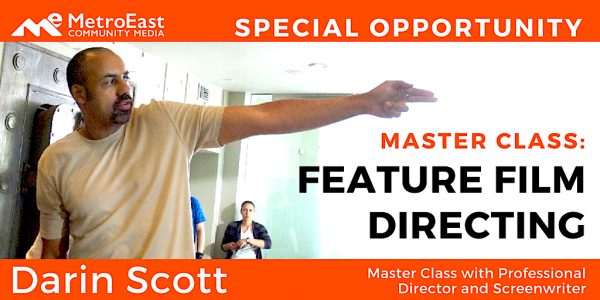 Whether you’re a Writer, a Producer, an Actor, a Director, or anyone else with a burning desire to tell stories in the cinematic medium, Darin Scott can show you the real life, no nonsense techniques that go into making a successful film, whether your budget is $5 thousand or $50 million. Darin has made movies and TV shows in all genres with major studios and networks. He wants to share that knowledge with you. He is currently directing the highly anticipated Deep Blue Sea 2. Learn real life secrets that you can’t get in film school. If you want to stop dreaming about being a filmmaker, and take the step up to the next level, sign-up for the most important workshop you will ever take. Give Darin Scott two days and he’ll make you the best filmmaker you can be. Darin Scott studied chemical engineering at USC before launching a successful career as a feature film producer-writer-director. Scott’s various Producer credits include: “From A Whisper To A Scream”, which he also wrote; “Stepfather II”; “To Sleep with Anger”, starring Danny Glover; Directors Allen and Albert Hughes’ classic “Menace II Society”; the comic hit “Fear of a Black Hat”; “Love and a .45”, starring Renee Zellweger; “Tales from the Hood”, which Scott also wrote; “Sprung”, from yet another Scott script; and the hit Screen Gems release, “The Brothers”. Scott has written scripts for Disney, Warner Brothers, 20th Century Fox, New Line, Paramount, Universal, ABC, Interscope, BET, and Lionsgate. Scott is directing two movies that are in post production, one of which is the highly anticipated sequel to Deep Blue Sea which will be in cinemas in 2018.